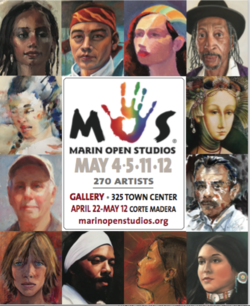 Marin Open Studios annual showcase for Marin Artists, returns for the twenty-sixth year this May. Over 270 diverse artists show and sell their works to the art curious public over two weekends May 4, 5, 11 & 12 from 11 am – 6 pm. The event is Free. All artist profiles and locations are found on the event website: https://marinopenstudios.org/ as well as at the popup gallery, 325 Town Center in Corte Madera between April 22 and May 12.